Microsoft have announced changes to pubCenter ad sizes and new targeted ad support. 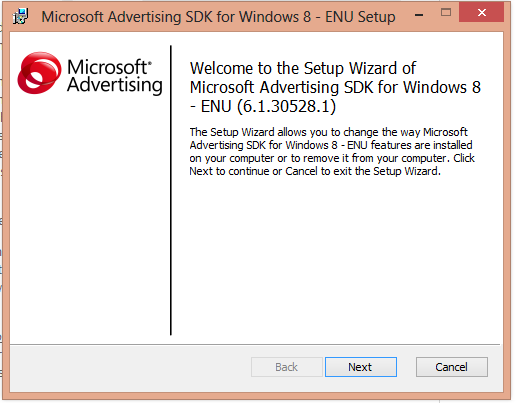 For Windows 8.1 there will be a new SDK, but there is also a new version of the 8.0 SDK. Even if you you don’t use these sizes you may still want to update to the latest ad SDK. Download the new SDK (this is the direct link). Open your app in Visual Studio. It looks like the installer overrides existing files. This seems a bit weird to me but I may just not be understanding how Microsoft have versioned the extension. So it’s probably safe to just reference via the Extensions rather than individually referencing the two files. Now it’s just a case of replacing any deprecated ad sizes with new ones (as well as creating any new ad units in pubCenter); and submitting new app package to the store. It’s a pretty painless process to upgrade. Hopefully the new ad size and targeted ad support and Windows 8.1 (Blue) will increase the fill rates and earnings for developers looking for an ad-support monetization model.